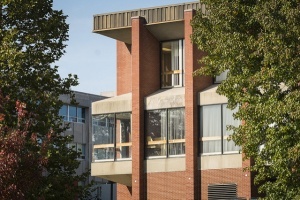 The Department of Biology is housed in the Hoyt Science Resources Center, a modern building that is well equipped to provide contemporary educational experiences in biology and the other sciences. The Hoyt Science Resources Center is also home to the Division of Biological, Chemical, and Environmental Sciences; and the Division of Cognitive and Quantitative Sciences. The building includes six lecture rooms, three smart classrooms, three computer laboratories, an auditorium, a planetarium, and four seminar/conference rooms. 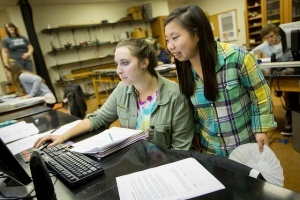 An important part of the educational venture in biology at Westminster is the opportunity for students to have hands-on laboratory experience with up-to-date equipment. For this purpose, the Department of Biology contains specialized labs and rooms for flourescene cell culture, microscopy and digital imaging, histology, culture of microorganisms/ cells/tissues, molecular genetics, human physiology, and small animal surgery. The department also has a museum, a darkroom, a computer room, and environmental chambers. Two greenhouses and an animal housing suite with specialized rooms for maintaining small mammals, aquatic organisms, reptiles, amphibians, and insects also support the program. The department contains sophisticated equipment unique for colleges the size of Westminster: PCR therocycler, IEC cryostat, fluorescence microscopes with digital imaging capabilities, gel imaging and analysis station, inverted microscope, refrigerated high-speed centrifuges, carbon dioxide incubator, laminar flow tissue culture chamber, and ultra-low temperature freezer. In addition to the fine facilities in the Hoyt Science Resources Center, the Department of Biology includes the 40 acre field station, for Biological and Environmental Science, the 15 acre Brittain Lake, and the 40 acre College Woods. The solar-powered field station, which is appropriated specifically for field biology studies, includes a year-round weather station, several buildings including a Nature Center/Classroom, the Lucille Beerbower-Frey Nature Trail, lowland thicket, pasture, arboretum, successional and experimental plots, marsh, spring-fed stream, and the Little Neshannock Creek. Brittain Lake, named in honor of J. Frank Brittain, is used for ecology and limnology field classes. The College Woods is a beech-maple forested area used for field studies requiring a mature woodland. It includes a recreational walking trail.